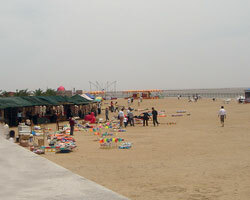 Fenxian District (a prime area) is famous for its ocean resorts and beaches. The district not only opens to the sea via Hang Zhou bay but is also situated between Tai Hu River, Chang Jiang River, and the Yangtze River delta. It is a stone’s throw from Shanghai’s city centre, Pu Dong Airport and Shanghai’s international trading and shipping ports. Much of Fengxian is relatively new, but due to its prime location, it is an area on the move. The area of Nan Qiao is being extended southward through a forest and transformed into a rich urban development for residents looking for 21st century convenience, against the background of beautiful marinas and moors. Nan Qiao, modelled after Barcelona, has tree-lined boulevards, green areas, and open and lively public squares. Jinsha, another area along the coast, is being turned into Shanghai’s top ocean and beach holiday destination. Small beach front communities have been built, alongside a golf course, tennis courts, swanky hotels, restaurants and other water sports and leisure facilities. Jin Hui Yacht Town plans to turn a 10-square kilometre area into a deluxe yacht harbour, complete with clubhouses and other amenities, plus an F1 power boat circuit and numerous other water sports and leisure facilities. Those looking for a bit of culture can stop by the major town of Nanqiao, and visit Guhua Park, home to the San Nu Temple. This is where the three daughters of King Wu, from the Zhou Dynasty, hanged themselves rather than surrender to King Yue.